Weeks ago, I happened to check the visitor posts on my Facebook author page, which must be approved manually. I quickly approved a post from a radio show that interviewed me about my memoir. A post from a man with a Trump avatar as his profile pic caught my attention. Rather than delete it outright, I clicked on it. This was a mistake. After watching my interview on MSNBC Live about white nationalism and Charlottesville, this man, a stranger, wrote that he wanted to drag me behind his truck until he killed me. He called me a number of derogatory terms reserved for women that I can't print in WIHE. Mostly, he threatened me with a gruesome death. This isn't the first time I've received a death threat; it won't be the last. It's been awhile since I received an outright threat. After my op-ed on the history of white nationalism appeared in The New York Times last year, threats flooded my Twitter timeline and inbox. The piece ran the day after Thanksgiving while my family visited a nearby amusement park. A friend messaged me to see how I was doing with all the nastiness in my Twitter timeline. I had no idea that I had been targeted. While the kids rode rides, I sat on a park bench and waded through the hate. I felt like I had been punched in the gut as I blocked and reported every troll who threatened me. My partner took my phone away when he realized what was happening and policed my mentions for the next few days. It was remarkably awful. I couldn't be happy about my op-ed because of the harassment. I wasn't sure that I ever wanted to write for such a big, well-known publication again. 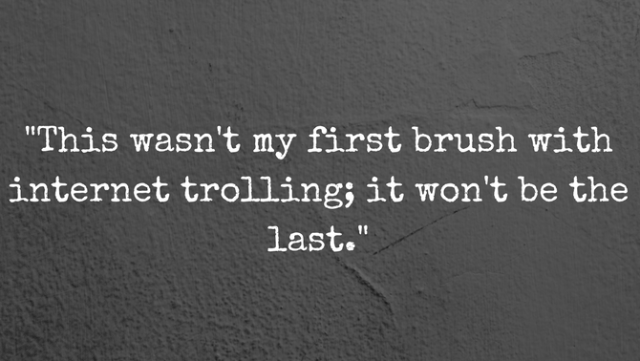 This wasn't my first brush with internet trolling; it won't be the last. Strangers tweet, email and message to let me know they think I should be harmed violently or even killed for what I write. It is a weird, terrifying experience to know that strangers hate you this much. It is also a gendered experience: These strangers are predominantly men. These men hate me enough because of what I wrote or said to tell me so. They hate me enough to call me names, comment on my appearance and threaten me. All of this because I'm a woman writing in public. My expertise, or even what I write, doesn't really matter. What matters is my audacity to be visible, to speak up and to keep writing even as they hope their threats will convince me to stop. Throughout the spring, I continued to write about white supremacy, but not at large publications. I hedged where my work was published. There was still nastiness, but nothing dramatic or new. So, I got used to not being threatened for my writing. Let's pause for a moment: I got used to not being threatened because of my writing. How messed up is that? What this means is that I started to let my guard down and not be as vigilant as I tend to be about email, posts or messages. I clicked on the Facebook troll's post before pausing to think about how terrible it could be. And it was terrible. I started shaking and crying. Anxiety made me queasy. My kids wanted to know what had happened to me and how they could help. How could I even begin to explain to them that a stranger threatened my life because of an interview? Why would I? I got angry, scorched-earth angry, at this man who threatened me. What kind of human being sends a death threat to another human being? I was angry at this troll for trying to scare me into silence. I was angry at him for ruining my day(s). I was angry that he dared to threaten my life. And I was angry at myself for reacting exactly the way this troll wanted me to. I was frightened, and he wanted me to be frightened. I wished I was made of sterner stuff, so I could ignore his threats and carry on. I can't because his words were repeating in my head. The damage was already done. When I get threats like this, I wonder if writing about white supremacy or sexism is worth it. I wonder if being a woman writer in the internet age is worth the threats and harsh words that follow my work. I wonder if it wouldn't be easier to keep my head down and my mouth shut. Wondering makes me even more furious. I'm furious that I have to deal with this kind of harassment. I'm furious that other women, especially women of color, have to deal with so much worse than what I've faced. I'm furious that my story, this story, is not the exception, but the rule. I'm furious, but I'm frightened. This man, whose name I cannot remember, wants me to be frightened, to shut up and to cease to exist. I want to be brave and claim that I refuse to be cowed by trolls. But sometimes, this all feels too hard. For now, I won't stop writing. I just wish this wasn't the terrain women writers are expected to inhabit. I wish I, and all women, could write and exist without threats. Don't you?